Pulsing waves beat a rhythm like a heartbeat, where movement is constant, change is the norm, and patterns distinct just below the surface are formed and reformed. The edge of the ocean, that surf line where water meets the land, is transformed as day ends. The light is softer, more oblique. Shallow pools of water become mirrors for the shifting light of sunset. Sand ridges transform into gold or pink lines; retreating waves form transparent curtains of color over pebbles and sand dollars. Mystery shapes of phantom foam drift with the tide as the surf shifts the sand. Darkening light rides the waves in bands of color. Night falls as the color spectrum shifts into blue. 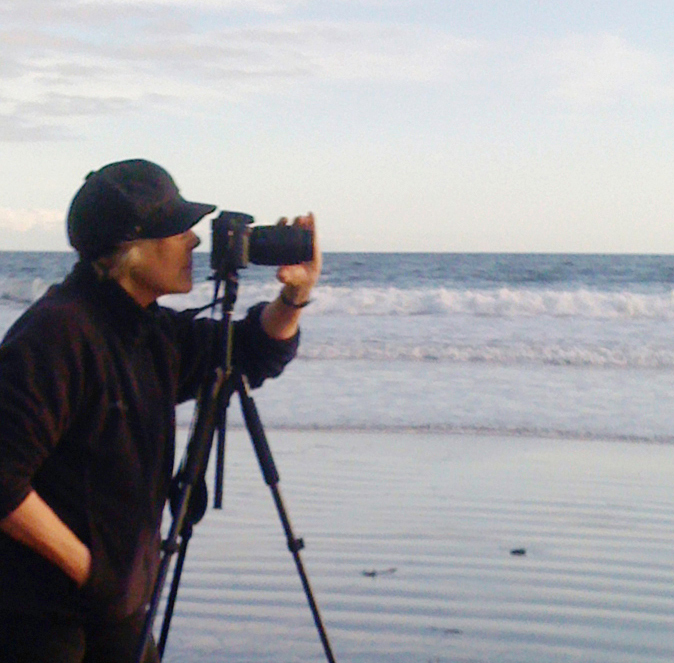 I stand on the beach beyond the surf, my camera on its tripod, focusing on receding surf. I capture the light and movement of turbulent water. I wait; as the day dies with the sun, my exposure times lengthen. I can no longer predict exactly what image is building up on the digital sensors of my camera. The night is now too dark to clearly illuminate the camera’s display; I focus as well as possible but rely on the histogram to adjust exposures. It is a calming, slow process. I am amazed how much light is captured in a second or 4 seconds or 10 seconds, and how the wave movement over thin films of water transforms the light into something mysterious and unpredictable. Distant waves become light traces that hide the ferocious power and relentless surge, deceptive in apparent calm. The ocean needs no filters, no photoshop drama, just natural light and a world of unexpected beauty. Photography becomes an exploration, searching for images that suggest, rather than depict, a scene. A camera, a tripod, long exposures, and time to paint the waves onto a screen with light: later I discover how the waves and light have transformed the landscape. The ocean maintains its rhythm and becomes a song of light, at the edge of the ocean, at the edge of the day.